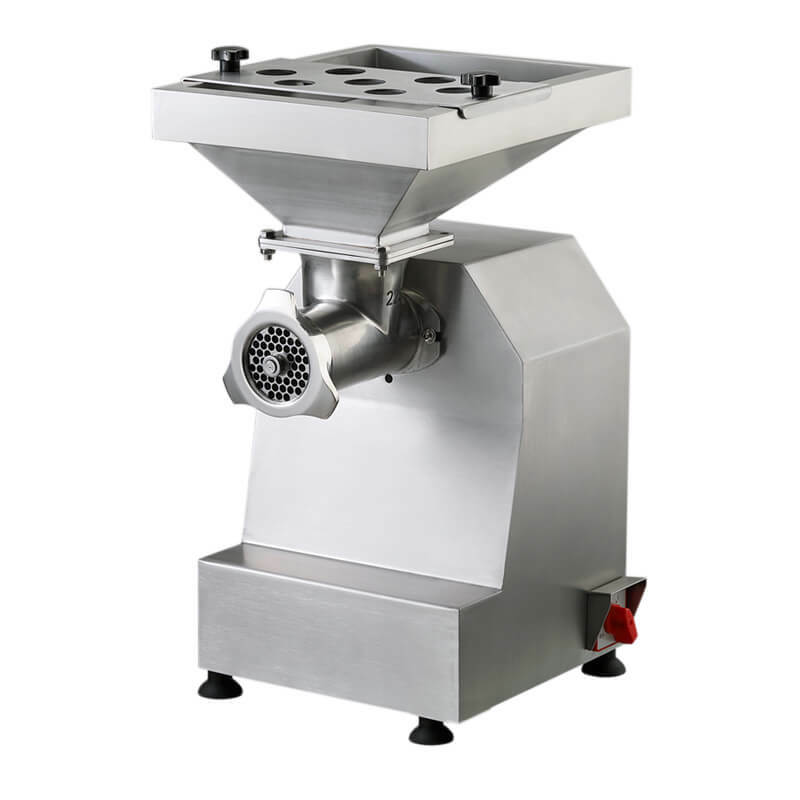 A meat grinder is a machine that twists meat that has been cut into pieces into pieces. It is an indispensable machine for sausage processing. The meat that has been twisted by the meat grinder can eliminate the defects such as different kinds of raw meat, different hardness, and hardness, different thickness of muscle fiber, etc. so that the raw materials of the sausage are uniform and the quality of the product is ensured. Before the operation, it should be checked: the machinery cannot be loose and cracked, the orifice plate and the knife are installed at the proper position, and the rotation speed is stable. The most important thing to note is to avoid the increase in meat temperature due to frictional heat and the squeezing of the meat into a paste due to the bluntness of the knife. The chopper is one of the essential machines for sausage processing. There is a small size chopping machine from a processing capacity of 20 kg to a large-sized chopping machine of 500 kg, and a kneading machine under vacuum conditions, which is called a vacuum chopping machine. The kneading process has a great influence on the adhesion of the control product, so it requires a skilled operation. That is to say, the kneading is to further mash the meat that has been twisted by the meat grinder, and the adhesive composition is analyzed from the composition of the meat, and the meat and the meat adhere. Therefore, the knives of the chopper must remain sharp. The kneading process adds seasonings, spices, and other additives to the side and cuts the meat and mixes them evenly. However, the results of the mixing are different depending on the rotation speed, the mixing time, the raw materials, etc., so pay attention to the amount of ice and fat added to ensure the quality of the mixing. A machine for mixing and mixing meat, spices and other additives. In the production of compressed ham, it is used to mix meat pieces and clam meat (meat chop) and mix raw meat and additives with a blender in making sausages. In order to remove air bubbles from the meat during mixing, we often use a vacuum mixer. 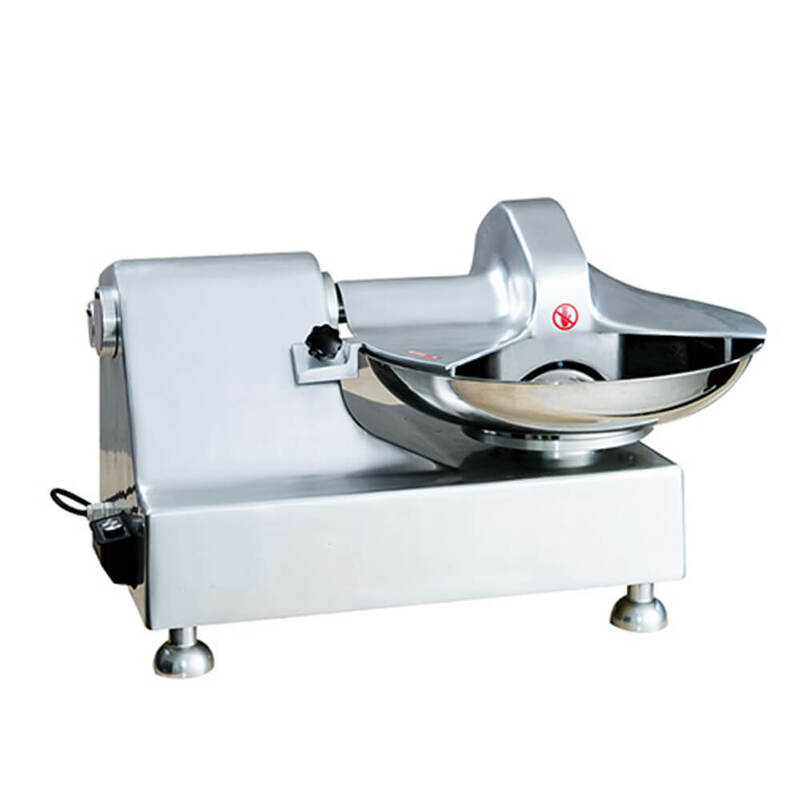 The frozen meat chopping machine is specially used for chopping frozen meat. Because the machine can cut the meat in the frozen state into the required size, it is economical and sanitary and is welcomed by users. A machine for cutting meat, fish or pig fat. This machine can cut squares from 4 to 100 mm in size, especially when making dry sausages.